Cats love seafood, but it isn't nutritious for them. Everyone knows how felines love fishy food. It's the rare kitty that will turn up her nose at a serving of fish. If it were up to her, your cat would probably dine exclusively on tuna and salmon. But believe it or not, that isn't a healthy choice for her. A cat in the wild may have to eat what she can catch. If that means snagging a fresh tuna or salmon that swam too close to the shore, then so be it. Your cat, on the other hand, is domesticated and has access to scientifically formulated food instead of having to rely on fresh fish for her nutrition. And it's a good thing: PetPlace.com reports that raw tuna doesn't provide adequate nutrition for cats. The meat doesn't contain enough taurine to keep your cat's eyes and heart healthy as a diet staple. Also, raw fish has an enzyme in it that renders iodine useless to her system. Raw fish can have parasites that may affect your kitty's health. Every time you open a can of tuna or salmon, your cat comes running, meowing her expectations that you'll share your lunch. She certainly can be difficult to turn down, but if either of you thinks canned fish can be the basis for her diet, reconsider. Just like raw tuna or salmon, canned fish doesn't have the vitamins and minerals your cat needs to maintain her health. Plus, fish that has been through the canning process may contain sodium and other additives that aren't good for her. Although it isn't a good move for your cat's health to place her on a diet of tuna and salmon, giving her a little bit of the canned version from time to time as a treat isn't bad for her if she's routinely eating a quality cat food. In fact, VetInfo recommends drizzling the water or oil from canned fish over your kitty's kibble to tempt her into eating if she is finicky. 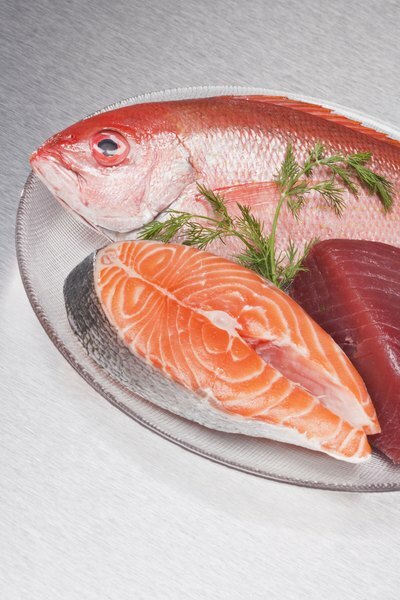 So you may be wondering what are these vital vitamins and nutrients that tuna and salmon lack? What makes them unsuitable as staples in your cat's diet? In "The Cat Handbook," K.L. Davis devotes an entire chapter to detailing the nutritional needs of cats. When reading labels to determine which cat foods are of quality enough to serve to your imperial feline, look for those that have amino acids, taurine, fiber, carbohydrates (such as rice, soy or barley), fats and protein. The list of vitamins essential to your kitty's health include B vitamins, niacin, folic and pantothenic acids, choline and vitamins C, A, D, E and K.
VetInfo: Ok to Feed My Cat Canned Tuna Instead of Canned Wet Food? What Kinds of Meats Can Cats Eat?